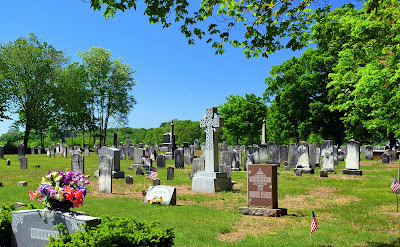 This past Friday I had occasion to be up in my hometown of Canterbury and after finding my mother not at home, I decided to stop by the cemetery where my father is buried and see how things looked for the upcoming Memorial Day weekend. 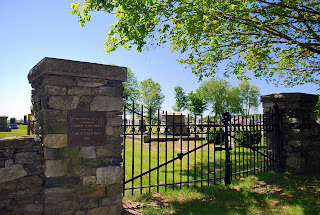 Carey Cemetery, established in 1750, has been the "family cemetery" for as long as I can remember and was strategically located between my grandfather's house and my Aunt Eleanor's house. If one were to walk from one house to the other, you had to go right past Carey Cemetery wherein was buried my mother's mother who died the year I was born, my mother's oldest brother who came home with strep throat one day and was dead the next at age 9, as well as other relatives that I had never met. 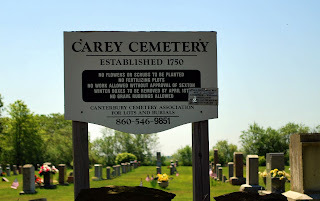 In later years Carey also became the final resting place of my beloved grandfather, two more uncles who died way too young, and other relatives and family friends. In 2003, it also became the last stop for my father when he succumbed to the non-Hodgkins' lymphoma that he had contracted as a result of exposure to Agent Orange during his tour in Danang, Vietnam in 1967-1968. My Dad's grave is through those gates pictured above and nearby are the graves of five other veterans; it makes me think my Dad is in good company. After spending some time at my Dad's grave, I decided to take a walk through the rest of the cemetery and check out the graves of the other veterans whose brand-new flags flapped in the breeze and marked the spots where their physical remains reposed. At Carey Cemetery there are veterans from the Revolutionary War to the Vietnam War as well as seven wars in between and as I stopped at each grave, I thanked each person for their service to our country and their role in keeping our country free. As I walked amongst the gravestones, I noticed that the majority of the veterans are from the Civil War era which somehow seems appropriate being that Memorial Day originated from the observance of a national Decoration Day to honor those who had died in that war. The first official Decoration Day was held on May 30th, 1868 as proclaimed by General John Alexander Logan, National Commander of the Grand Army of the Republic (a fraternal organization composed of veterans of the Union Army who had served in the American Civil War). If you're interested in reading more about how Memorial Day came about, I did a post last year that explains it in more detail. It appears that the small town of Canterbury (with a population of approximately 1,700 in the 1860's) sent more than its fair share of men to fight in the War of Northern Aggression (as Miss Bee likes to call it). Even if you didn't know the number of men who died fighting to keep the Union as one - best estimates put the total deaths at 620,000 - you would know that it was a large amount just by the number of graves belonging to Civil War soldiers in Carey Cemetery. Of the Civil War veterans, there are five graves of soldiers who died on September 17th, 1862 at the Battle of Antietam near Sharpsburg, Maryland. Antietam was the first major battle to be fought on Northern soil and, with approximately 23,000 causalities, it was the bloodiest single-day battle in American history. More Americans died on September 17th, 1862 than on any other day in our nation's military history; five of whom lie beneath the soil of Carey Cemetery. Naturally I had my camera with me so I decided that as a tribute to the veterans whose graves I visited while walking through Carey Cemetery, I would take a picture of their grave markers and then put them all in a slideshow to honor their service to our country. It seemed like the least I could do for all that they had done for myself and all other Americans who enjoy the freedoms that we so often take for granted. If you haven't done so yet, please remember to thank a veteran for his or her service to our country. Memorial Day is set aside to remember those veterans who died but wouldn't it be nice to acknowledge them while they're still alive and can hear your thanks? I'd like to think so! Oh, Linda, that was an amazing video. Simply wonderful. I pause to remember them all and thank them for their sacrifice. And thank you for your service! thanks for YOUR service my friend! great post linda, thank you for your service and remember that all gave some and some gave all…. Beautiful tribute my dear. They all have my eternal gratitude for their sacrifice. You and your family also have my thanks for your service. Just as a side note here, my service in the Air Force is hardly worth noting. I served from June of 1976 to April of 1981 during a time when there were no campaigns or wars or police actions or anything of that sort. It was, for once, a very peaceful time in our military's history. As such, my time in uniform really doesn't count for much of anything and I feel a bit awkward when people tell me "thank you for your service" as I did nothing out of the ordinary. My thanks go to those service men and women who served during times of war and conflict and who were in harm's way protecting this country of ours. They deserve all the thanks in the world! Great post and tribute, and don't you dare belittle your service to our country. You wore a uniform, so that counts! And you are still in a 'service' industry, so that counts as well. THANK YOU. Linda, that was a beautiful tribute, but you forgot my Dad, Grover C. Swan, Jr., a Purple Heart veteran of World War II. 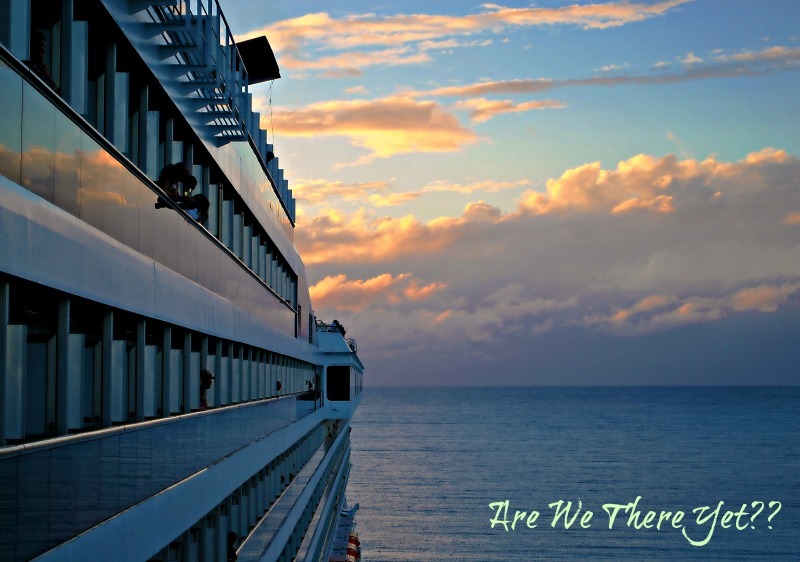 I hate being so far away. I can't even put flowers on his grave and make sure he has the flag that he so richly deserves. I too, want to thank you for your service to our country. So you weren't involved in a war...if we HAD been at war when you were in you would've gone and given your all. I know what an honorable person you are, and I DO thank you. I was afraid that there were some that I missed though I tried to go to every marker that had a flag; I'm sure that there were some that were missed, though, as I've seen that cemetery in much better condition (especially when Uncle Al took care of it). My thanks definitely go out to your father for his service and I will go over and make sure he has a flag in your absence. If he doesn't, you can darn well bet I'll get him one! This is a beautiful post and slide show, Duchess Linda. I think your service to our country is indeed worth noting. Carey has a fine history. A good place to visit. Thank you for working for this country of ours my friend!!! I love your post... read miss bee's and cried like a baby.. Saw you had been their weeping also... I miss ya.. I am so very sorry we didn't get to hook up in California.. While I was reading your comments and those of others, I was thinking exactly what Alison said. You wore that uniform knowing that, although it was a time of peace, anything could have happened and your world could have changed in the twinkling of an eye! Your time of service means a lot to me and I humbly thank you for your willingness to be there for us!!! Your video and music made me weepy, but that's okay. Tears shed for heroes are never wrong! Thanks so much for all of the time and effort you put into this post and for bringing a bit of your personal history to life for me. A wonderful tribute both for your father and the brave who keep him company. Their sacrifice has made our lives possible. I too visited Carey Cemetery last Friday. I agree. The cemetery was in much better condition when Uncle Al and family took care of it. This is beautiful! The flags add to the solemn reverence of this place. If not for their service would there even be 50 stars on the flag? Or worse, what about the continuity of our wonderful republic? Thank you for posting about the true meaning of this day. My Dad is my hero, a vet of WWII. He didn't die during his service but due to it later in life.